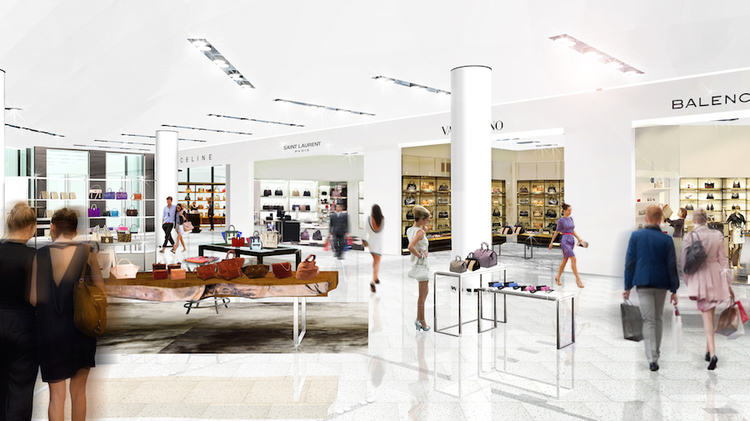 In advance of the invite-only media presentation on Thursday, advance renderings of the ground-floor interior of the soon-to-launch Nordstrom Vancouver flagship in Pacific Centre have been released by Retail-Insider. According to Retail-Insider, the Nordstrom’s ground-floor women’s designer handbags department, will feature shop-in-stores for brands, including Céline, Saint Laurent Paris, Valentino, Delvaux and Balenciaga. 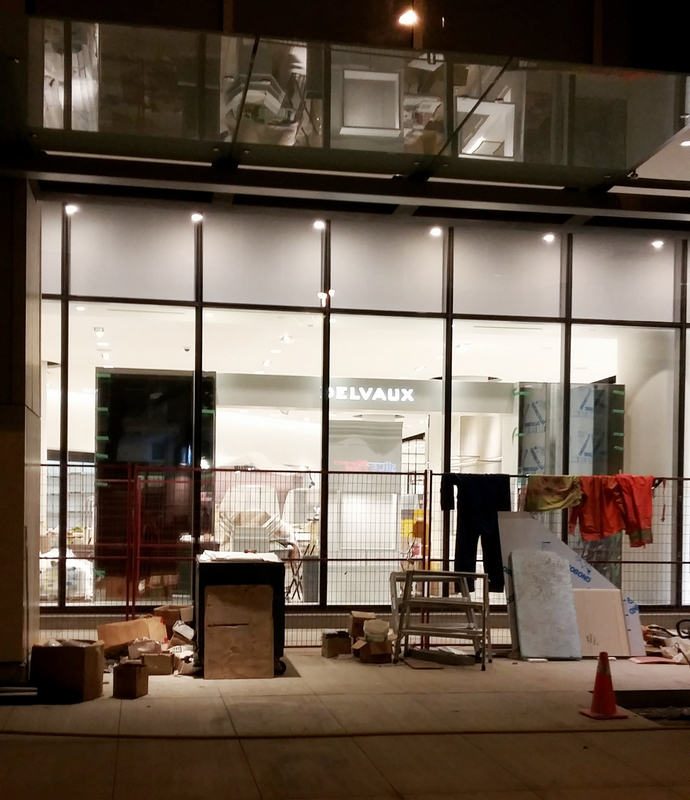 For those not familiar with ultra-luxury, Delvaux is a Belgian leathergoods brand costing into the thousands, currently available in the U.S. at Barneys New York. 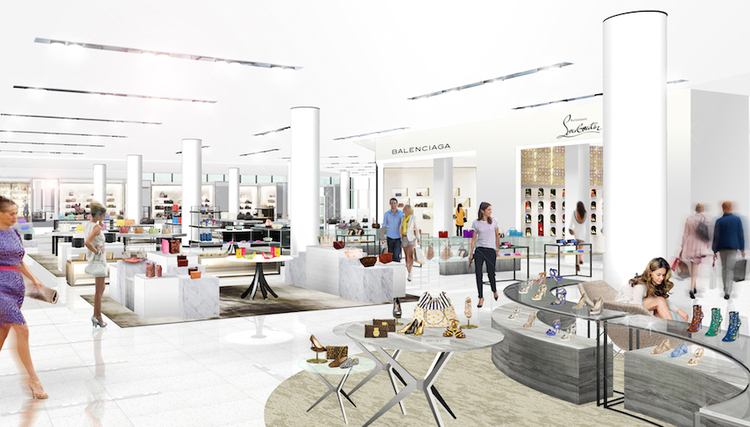 Christian Louboutin and Balenciaga are shown in the rendering of Nordstrom’s ground-floor women’s shoe department. The Balenciaga shoe shop will be a first for Canada, and Louboutin’s boutique will be a Canadian second, the first being the Louboutin boutique at Toronto’s Yorkdale Shopping Centre Holt Renfrew in December of 2013. Literally blocks down Granville, Vancouver’s mainstay for luxury designers and labels, Holt Renfrew has announced that by the end of 2016, the current 150,000 square foot store will expand by 40,000 square feet to occupy about 190,000 square feet. Its women’s handbags department will expand to an immense 30,000 square feet, while women’s footwear will triple in size to about 10,000 square feet. Although Holt Renfrew won’t officially reveal what new brands may come to its expanded store, sources from Retail-Insider say that Prada-owned Miu Miu could open a shop-in-store leather goods concession, and that its women’s footwear department could see several new shop-in-store branded boutiques like Jimmy Choo, Manolo Blahnik, Christian Louboutin, Gucci and Salvatore Ferragamo.